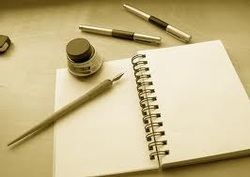 Writing is the key to being a successful communicator in the world. If you cannot present yourself on paper, print or media, you will not succeed in life. Concerned? Don't be. This course will take you through four analytical papers which will give you the tools needed to organize your ideas. Pay attention. Learn from your mistakes. If you do, you will be able to not only succeed in class, but be a successful person. The PowerPoint below will walk you through the steps of creating a great paper. To run the PowerPoint, download it, and then click "Run SlideShow". Follow the directions on the screen.